This year’s SGA elections will be from 9 a.m. to 3 p.m. on Tuesday, April 16 for executive office positions and class senators. The election for senators-at-large will be Thursday, April 18. Students will receive a link to their ballot via email tomorrow morning. The candidates for secretary are Mimi Vance and Hank Warren. Chloe Allen, candidate for treasurer, is running unopposed. 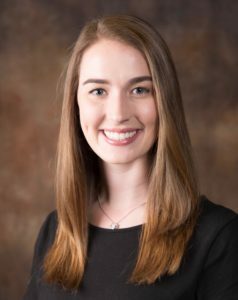 Lumination’s Carly Reams spoke with each presidential and vice presidential candidate to hear their visions for Lipscomb in the future with SGA. I would say there are two basic reasons. I feel like I have a heart for Lipscomb, and there is a reason and a why behind the things I do. When I came to Lipscomb, I was filling out transfer applications and you can just say, I didn’t want to be here. I had planned for a long time to go to Pepperdine. Due to financial circumstances, I ended up at Lipscomb. It’s not that Lipscomb is a bad school by any means, I had just grown up and toured these places and seen my friends go there. They were just my dream schools, but I stayed here because I freaking love not Lipscomb University and all the rules, but the people and the students and many of the teachers. That’s why I do what I do. It’s why I try and make these changes, and I run for SGA. I do this on my own time because I have a heart for Lipscomb. I have a drive for Lipscomb; I have a plan for Lipscomb, and I’ve been trying to walk that out as best I can this year. Have you served on SGA before and in what ways? I have served on SGA since freshman year. So, freshman year I was the senator, and then, sophomore year in the fall, I was co-chair of the social committee. This year, I am the social committee chair. Sierra, Emily, and Annie call me their water boy. I call myself the acting executive. I come to all the executive meeting and luncheons. 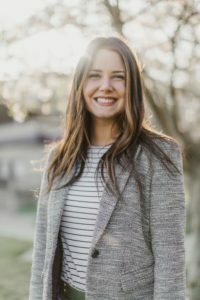 Whenever we had our lunch with Dr. Lowry, I was the one who drove the conversations because the three things that were in that conversations were amending the alcohol policy, increasing the student budget and hiring people in student life so that students have a vote in the final say. Also obviously, I’m running for President next year, so we will see what happens. 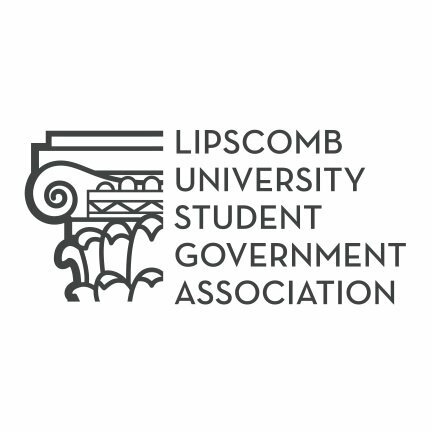 If elected, what is your main goal to accomplish for Lipscomb’s SGA and student body? What the alcohol policy really boils down to is that I want to see if you are 21 and you are off campus, you can drink responsibly, at least not to intoxication if you complete what I call an “alcohol workshop.” Eventually, some part of that is going to have to be a class of the basic elements of alcohol use. I would love it to be where we leverage our faculty relationships. 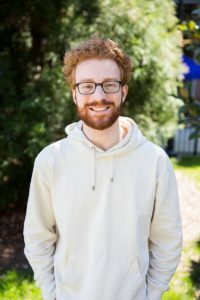 So apart of that would be, going to a faculty’s house so they can talk to you like “this has been my experience with alcohol, and my dad was an alcoholic so I don’t touch it” or “I use it, and it’s normal and it contributes to my life.” The reason for the change is it lets the university double down on the distinction between alcohol use and abuse, and open up a conversation around alcohol, which we can’t have right now due to our policy. For the SGA budget increase, I would love to see a signature event on campus. I know a lot of colleges have big concerts. By the numbers, we get $30 per student per semester, and I would love to see that go to a concert in Allen Arena. I think for a lot of reasons if we used Allen as a venue, not only for the university but to the community, they could make a lot of that money back. Besides that, I want to see it increase because we are a different institution than we were 10-15 years ago. We are more diverse. We have new colleges, like engineering, and we have more commuters now. The university has made a big push in a lot of different areas. This means the groups that come to SGA and the student’s needs now are not only different from what they were 10 years ago, but they’re more numerous. Increasing the SGA budget lets us support student’s better. That’s the spirit behind me wanting to increase the SGA budget. I’m focused on more campus events and being able to support these new student organizations and increasing our ability to do so. I would say that it is the work I have put in this year and the meetings that I’ve had with administrators about these different things. That’s not just about me saying ‘I want to increase the budget’ or ‘I want to amend the alcohol policy’, but it’s about the 7-page document that I authored and presented to Dr. Lowry or my multiple meetings with Annie Taylor, the SFO, about increasing the budget and the logistics of that. There is a ton of stuff that I could talk about that because I haven’t worked on it yet, I don’t address it. Not because it’s not on my mind or because it’s not apart on my vision, but because I want to emphasize what I’ve done so far. I don’t want to sell people an if, I want to sell people probably. The meetings I’ve had, the work that I’ve done already, and my vision exceeds both Breckin and Jase’s in terms of how thought out it is. I haven’t really heard much from Jase’s besides he wants to be a voice for all students. I’m not discouraging that, I just haven’t heard concrete ‘I’m going to X, Y, and Z.’ Breckin has talked about student center renovations and keeping connections between administrators. She talks about keeping our lunches with administrators, and that’s not in question. That’s the plan to continue next year. I’ve spoken to them about the student renovations and found out that they just are going to happen. We don’t really have a student hang out space on campus so I actually pitched an idea to renovate Zebbies. I want people to feel like they can come to me. I have things that I’ve worked on and things that I want to see, but I don’t want it to be like I’m coming in saying ‘hey Lipscomb vote for me for president because this is what we’ve got to do.’ I believe in the values of these initiatives, but there are experiences and there are needs on campus that just because they’re not mine, doesn’t make them any less valid. I want to be approachable, and more than being approachable, I want to be accessible. I’ve posted on my Instagram, ‘This is my number: text me or call me.’ For example, something that we’ve been meaning to have a conversation with the administrators is about security on campus. I think it’s a no-brainer to put scanners on every building that activate after 11:00 P.M. Then it’s like, ‘What if I don’t have my ID and I can’t get in the student center?’ Well, someone came up to me and told me that Stanford has ID scanners on their phones. Why don’t we do that? Any common student who’s never been on SGA can give us a great idea. It’s not like we are any smarter. We just have more conversations, and we are a little more involved, but that causes us to miss a lot of stuff. I want to be my own voice, but I want to draw from the voices of all these students. It’s been SGA presidents who have really made a huge impact on my experience at Lipscomb. I was put on the personal leadership council my very first day of classes freshman year by Jackson [Smith]. Jackson made a pretty big impact in my life simply in the way that he just recognized the freshman and made us feel noticed. If he saw me, even across the square, he would shout across the square, “Hey Breckin. How are you?” I think, even in a micro sense, the SGA president has a lot of power to make people feel special or seen. Even if it’s not in a way that is changing policy, then it’s simply making people feel heard and recognized. I think Carson did a great job at that, and I know Sierra does a great job. For me, it’s more to perpetuate that legacy of really putting students first and seeing students as students. I wanted to see that happen this year. I knew that I would put that at the forefront of my mind. Have you served on SGA before and in what ways? If not, are you involved in any other groups on campus? Like I said, I was voted freshman leadership council. There hasn’t been a day when I was a student at Lipscomb, other than the semester I was abroad, that I haven’t been involved in SGA. This past year, I have been serving as SGA spiritual life committee chair. There are four executive positions, and then 28 senators: five per class and eight at large bids This makes up everyone that goes into this puddle of committee members. All those students are split up into four committees. There is a spiritual, social, academic, and communication committee. I’ve learned a lot about relying on your people. I know this past week alone we’ve done prayer in the square. It fell apart in some ways because it wasn’t even in the square. Had it not been for the people on the committee and those not even on the committee who stepped in to help, I never would have gotten through that day. Yesterday, we had the women’s retreat which is a huge undertaking. It’s an entire day worth of events and speakers and catering. We have all these different pieces to work with that make the day come together. I think if I had tried to do all that alone, it never would have happened. I put a lot of weight on my committee members, but, at the same time, it is because I trust that they can do the job. I think it empowers them to know that I don’t feel a need to take it all on myself. I know there has also been a lot of talk about the alcohol policy this election. One of the things I was appointed because executive officers have already talked with administration about developing that policy, is to put that back under the spotlight of things we are trying to make decisions on. What I would want to do is to continue to facilitate that conversation until we have a good samaritan alcohol policy. I think that’s a really reasonable goal. It just worries me because that is a safety issue for students as well as a health and medical issue, and I honestly don’t understand how Lipscomb doesn’t already have that. That’s something that I am also really passionate about, and I know Macy Glassco has put a lot of work into that so we can hopefully achieve this next year. I’ve gotten this question a lot, and I think that a lot of things are similar as far as what we want. We all want the same things out of this situation and out of the presidency. I think we all want student involvement, but we have different ways that we want to make it happen. Ultimately, I think what I bring to the table is a really great balance of getting things done and caring about students. I think those are both equally important. I have involvement all across campus that gives me an insight into what students who have never been involved in SGA care about. That could be students who are involved in mission trips and that’s their one passion, and because I’ve been on mission trips; I know those students. I talk to them. Also, students who are fed up with their major or their college — I’ve been in classes with those students. I think that I am someone that is very good at building relationships with people who are nothing like me, and that will work in my favor. That’s something I will really want to draw upon when I am making decisions that impact the entire student body. 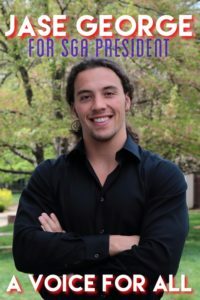 I’m running for president because I feel like the position is the outlet of the students to the people that are in charge such as faculty and other administrators. I feel like during this election it’s easy to go and check off tick boxes on whom you’ve talked to, and that’s what a lot of people do. Most people feel that a presidential candidate has a good vibe about what the whole school is about just because they went and said hello to everyone during their election week. I’m about all the time talking to everyone that I can. So the reason I’m running is so that I can give an accurate voice to the entirety of the Lipscomb student body. I don’t want to have a certain little group that runs the show. I want to honestly voice an opinion that is a collection of ideas of everyone, not just a certain group. I served on the communications committee, and it was really cool to see how involved the people that are in SGA are and how professionally it’s run. I really enjoy being around and with a group that makes people want to do better and want to do the right things for others. It’s just a really good setup for actual life and to really take things seriously like voting on things that matter and that have immediate effects. I want to increase student involvement. If I get put in SGA, I think we’ve got the events whether it’s a theater show or sporting event, but it’s just all about getting students to go and making that the place to be. We need to be advertising it right, getting people on board no matter their group. I want to get the athletes to go to theater shows and get the theater kids to the sporting events. I think that’s really what makes it because whenever you have teams supporting each other then that’s when you start really coming together. Everyone will know that we are trying to build up the whole unit as opposed to just a little part of it. I want to make it a place where everyone’s opinion matters. I feel like I genuinely talk to every type of person on Lipscomb’s campus. I think that really just sets me apart. I think the others are really good at what they do and they’ve got great qualities, but I don’t think that they have a sense of exactly what is going on in all parts of the school in the same way that I do. The amount of people I know because of the level of connection I have with each of them at this school really makes my position unique. In response to the alcohol amendment that the other candidates are proposing, my opinion on that is that we don’t need to make any changes. The reason for that is that I think it’s backed in that I’m not going to fight to do something that I know leads to bad decisions. My fight is not going to be for making something that could be very bad and more allowed. That’s not saying that I think that it is just absolutely correct right now, but my thoughts on it are that I’m not going to make it part of my campaign to make something more accepted. That’s not something that I want to push, and that’s something the other candidates have really hopped on. I want to push other things. I want to promote coming together more than I want to push legalizing something that could really lead to a lot of pain and a lot of hurts. Why are you running for vice president? I’m running for vice president because I’ve loved serving on SGA this year as secretary. I feel like being vice president, I will be able to make the next executive’s transition easier, as well as, continue the progress of what I’ve already started without having to start from a complete blank slate. That’s what we started off with this year, and although that was super helpful because we were a very driven team, I feel like having someone who has already been in a lot of the places that we are entered in this year it will be super helpful for the next executive team. My sophomore year, I served as a senator, and I was on the social committee. I loved that position so so much. Being involved with planning events and everything made me want to run for secretary. One of my goals when I was running for secretary was to bridge the gap between administration and students which we have so been able to do this year. We accomplished that through the lunches and many other experiences. It’s been super awesome getting to connect student’s to the resources they need by them just asking us questions. We get to help so much from all the questions we hear from students like, ‘Why is it hot in Elam in the summer?’ That’s one thing that I hope continues into the next year just being able to continue to advocate as well as provide students with those resources that they need. I think there’s a few. Each student feeling like they have a voice is a really big goal of mine. That’s why we’ve started this year talking a lot to administrators, but we’re also very willing to talk to every single student that has a question. We’ve been very open about that, but next year I want to talk about it more. We have had a couple of town hall meetings, but they weren’t as widely attended as I wanted. So next year, one of my main goals is to connect the student body and make sure that every student, if they want to ask a question, ask if they can. I feel like I will have more of a voice being vice president this year, but the way that Sierra [Sparks] and her executive team this past year had everyone involved was incredible. It allowed everyone to have a voice. So I actually feel like it will just be me stepping into more of a role that I’ve already taken even if that wasn’t my position.